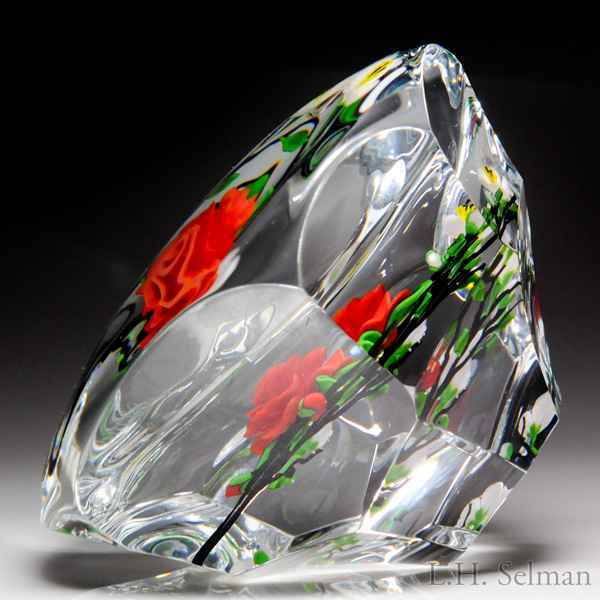 Victor Trabucco 1986 oriental red camellia branch upright magnum faceted paperweight. A large red flower blooms atop a twisting and forking dark branch flanked by two companion buds below. Another dark branch, with two contrasting white blossoms and four companion buds, hangs overhead. Green leaves dot the branches here and there. Clear ground. Two rows of eight uneven angular facets. Signature cane. Signed/dated. Diameter 3 13/16".